Carol Levine is the Director of United Hospital Fund’s Families and Health Care Project. She is a noted policy expert, recognized for her work in the field of family caregiving as well as on ethical issues in HIV/AIDS. She is a fellow of The Hastings Center on bioethics, a previous MacArthur Foundation fellow, and editor of numerous publications. We have been fortunate to count her as an advisor, collaborator, and guide throughout the Atlas of Caregiving Pilot. In this final look behind-the-scenes of the project, she shares some brief impressions and insights. Carol Levine [CL] My professional background includes many years working in the field of medical ethics, with a particular emphasis on research ethics. I spent several years in the 1980s working on ethical issues in HIV/AIDs, especially the impact on orphaned children and the changes in family structure that the epidemic created or responded to. I came to family caregiving as a researcher, writer, and policy analyst, however, through my personal experience as my late husband’s caregiver for 17 years after he was totally disabled in an automobile accident. Nothing and no one prepared me for the totality of caregiving or how I would have to struggle to maintain my own identity while becoming my husband’s advocate and care manager. [MCT] What drew you to participate in the Atlas of Caregiving? 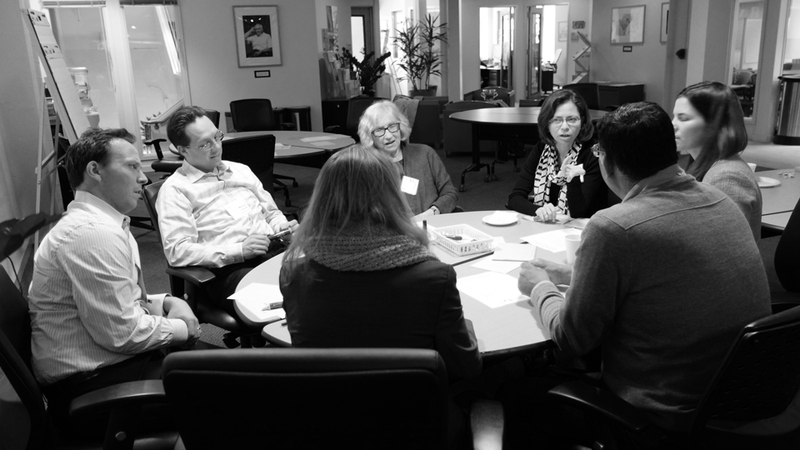 [CL] I met Rajiv Mehta (Atlas of Caregiving Project Director and Principal Investigator) in April 2014 at a conference—“Catalyzing Technology to Support Family Caregiving”—at the Institute for the Future in Palo Alto, California. I went to the conference rather skeptical about the topic but willing to learn. An artist captured the conversation about what caregiving involves as we spoke. Her visual representation covering several walls crystallized for me what was lacking in so many caregiving research projects—not just the crisis moments or levels of “burden” but the complicated overall experience; and not just doing ordinary, repetitive tasks but having one’s life dominated by them. Raj’s vision of capturing this phenomenon through technology and ethnography was compelling then and remains so. [CL] I was impressed by the willingness of the families to participate in such a demanding process, not just in time but in thinking about what they were doing in new and potentially unsettling ways. Although the caregiving situations were diverse, one thing that stood out most was the way time was almost a character in their stories. Some events that didn’t take a lot of time seemed to be endless, while others of longer duration went by without much notice. Most research asks about “amount of time” spent on caregiving, not about the quality or the perception of time, which is what really matters. The care mapping experience—pencil and paper, definitely low-tech—turned out to be one of the techniques that is most readily adaptable. [MCT] How might this experience impact your own work in the future? [CL] I hope to continue with the Atlas of Caregiving project as it expands to include more participants and works with them over a longer period of time. Caregiving is dynamic, and it is important to see how things change, for better or worse, and how caregivers adjust. In my day job at the United Hospital Fund, I hope to bring the insights of the Atlas of Caregiving project to the more policy- and practice-oriented work we do. We have found that professionals, like everyone else, find stories compelling, and the stories from the Atlas of Caregiving have data, visualizations, and other metrics but are driven by real people’s experiences. We are grateful to Carol for her incredible support of our work, and her groundbreaking leadership in the field of family caregiving. We hope you’ve enjoyed our recent conversations with Atlas of Caregiving advisors, collaborators, and partners, and are thrilled to be just days from releasing our initial research findings!